All seventeen peaks of this Himalayan range shine above Darjeeling. From West to East, they are Kang Peak, Jannu, Little Khabru, Khabru, Dom Peak, Talung Peak, Talung saddle, Kanchenjunga, Pandim, Jubonu, Simvoo, Narsing, Siniolchu, Pakichu, Chomiomo, Lama Andem, Kanchenjhau. 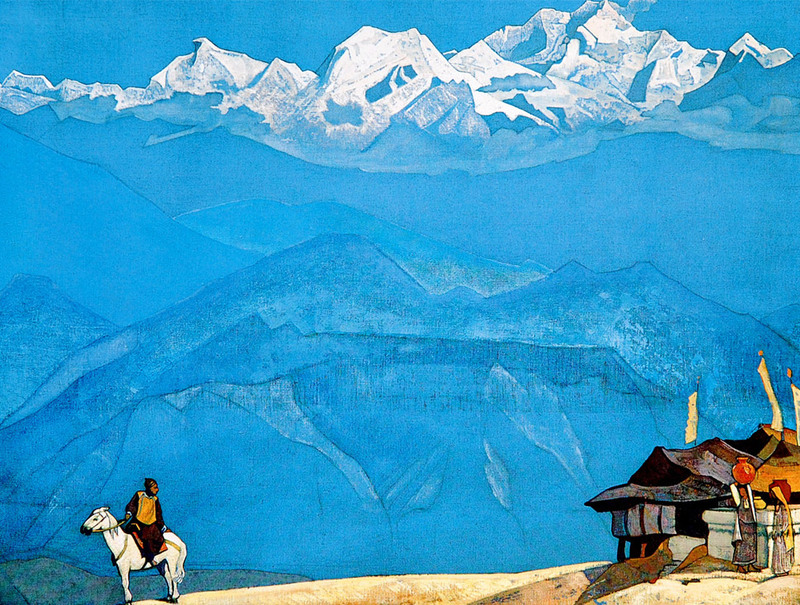 Kanchendzonga : "The five Treasures of the High Snow" as originating from Tibetans. The Treasures are considered to be the five repositories of God, which are gold, silver, gems, food grain and religious texts. "This blessed country, full of reminiscences of the illumined leaders of religions, leaves an impression of great calmness. Here lived Padma Sambhava, the founder of the Red Cap sect. Atisha, who proclaimed the teaching of Kalachakra, crossed this country on his way to Tibet. Here, in the caves, dwelt many ascetics, filling space with their powerful thoughts. Behind Kanchenjunga, in subterranean caves, still live hermits, and only a trembling hand, stretched out for food in answer to a pre-arranged knock, indicates that the physical body is still alive. It is a whole snowy realm, altering its outlines with every variation of light! Verily it is inexhaustible in impressions and unceasingly evocative. Nowhere else on earth are expressed two such entirely different worlds. Here is the earthly world, with its rich vegetation, brilliant butterflies, pheasants, leopards, panthers, monkeys, snakes, and the innumerable other animals that inhabit the ever-green jungles of Dorjeeling. 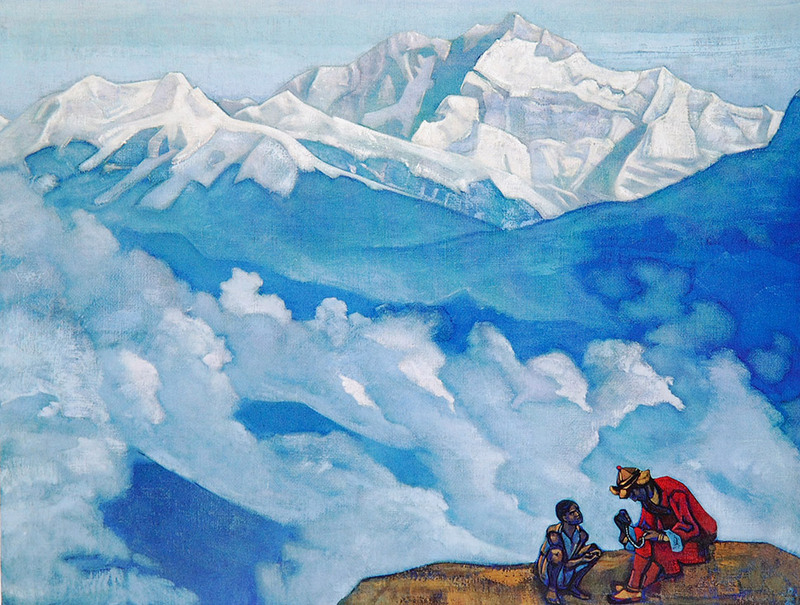 And above the clouds, in unexpected heights, shines the snowy kingdom, which has nothing in common with the busy ant-hill of the jungles. It is an eternally moving ocean of clouds, with untold varieties of mist. 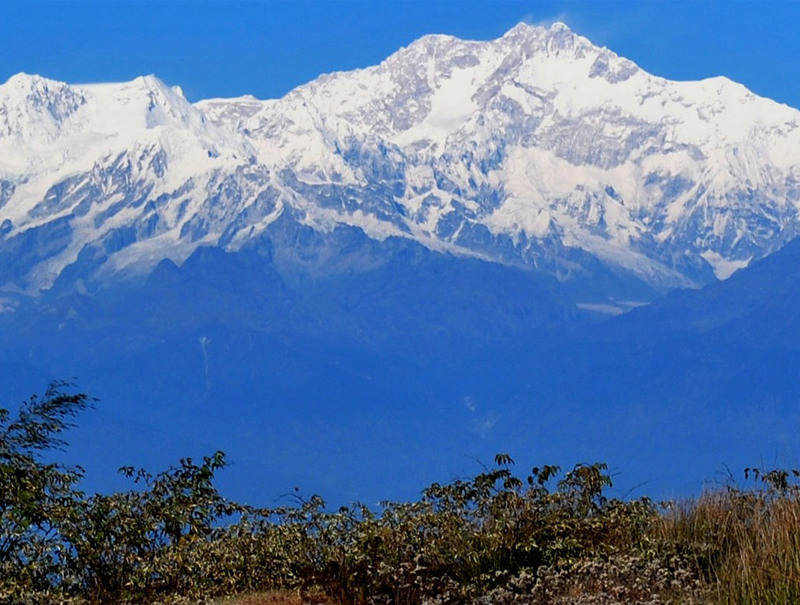 Kanchenjunga has attracted the attention equally of Tibetans and Indians. Here was created the inspiring myth about Shiva, who drank the poison of the world for the sake of humanity. Here, from the churning of the clouds, rose the brilliant Lakshmi, for the joy of the world."